The company that owns and runs the largest mall in America pitched to build an even bigger one in northwestern Miami-Dade, a roughly 200-acre entertainment complex with submarines, a Legoland, sea lions and an artificial ski slope. In later discussions with the Miami planning commissions, the developer revealed the most recent plan which details a 6.2 million-square-foot project that will cost $4 billion to build. In the revised plans, a residential component and sea lion exhibit has been removed from the original proposal. Current plans for the American Dream Miami would have over 3 million square feet of retail, about 2 million square feet of entertainment and 2,000 hotel rooms. That’s larger than the Mall of America in Minnesota. As previously mentioned, the entertainment would include a theme park, the world’s largest indoor ski slope measuring 180,000 square feet, 800 feet long and 16 stories high plus an ice climbing wall, a water park, a giant observation wheel, a submarine lake with marine life such as sharks and manta rays, an Art Deco village with performance halls and a 3,000-seat movie theater, an ice skating rink, a museum, bowling, and mini golf. This 16-story structure would house an indoor ski slope with an 800-foot stretch of artificial snow. It’s described as big enough to qualify as the largest mall in the United States. “Ski slopes! Coral reefs! Sea lions! Submarine rides!” says Robin Lewis, a New York-based retail strategist and co-author of The New Rules of Retail — Competing in the World’s Toughest Marketplace, as he ticks off on his fingers some of the attractions promised for American Dream Miami. “I think they’re going to make it. “Shopping malls have got to offer some kind of entertaining experience to go with buying stuff. And I think Triple Five is doing just that.” The strategy has worked very well for Triple Five’s other properties. Time magazine last year declared the Mall of America the most popular attraction in the United States, drawing 40 million visitors — a third more than Walt Disney World and Disneyland combined. The West Edmonton Mall, the largest in North America, was not far behind with more than 30 million. “They’ve shown us, in practice, what a mall should be,” says Legaspi. “Their malls are an interactive experience, which makes the shopping almost tangential.” The success of those two properties has enabled Triple Five to keep expanding at a time when most other mall operators are standing pat or even shrinking. 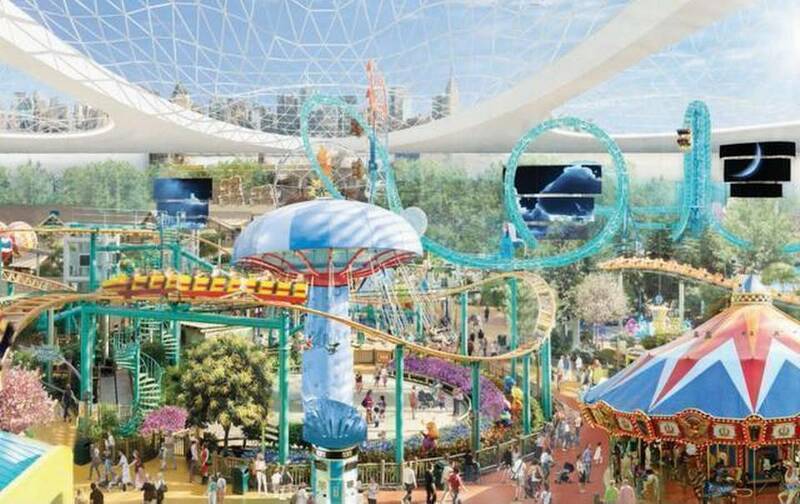 It is also building another huge mall in New Jersey, American Dream Meadowlands, scheduled to open next fall. Backed by the owner of Minnesota’s Mall of America, American Dream Miami is proposed for land at the intersection of Florida’s Turnpike and Interstate 75 near Miami Lakes. Miami-Dade Mayor Carlos Gimenez revealed the deal Thursday in an interview, and said the venture promises to provide a historic boost to the county’s economy. Mall of America owner Triple Five is not asking for government dollars or free land, Gimenez said, but wants to create the kind of large-scale theme park that can attract visitors from around the world and sustain thousands of jobs across Miami-Dade. It’s largely modeled after Triple Five’s other East Coast expansion, another massive American Dream complex planned for New Jersey. That 3-million-square-foot complex is described as having some of the same features as the Miami proposal, including an indoor domed amusement park with a roller coaster, a water park and a Ferris Wheel.Development there fell behind schedule amid financing complications, but Triple Five, which took over in 2010, says the project should open next year, the (Bergen, N.J.) Record reported in January. Triple Five Group is seeking a branding partner for the project’s entertainment. Gorlow mentioned DreamWorks and an associated on-site film/TV production studio as a possibility for the project, as Triple Five Group has partnered with DreamWorks for its American Dream project in New Jersey. However, Gorlow said they aren’t in serious negotiations with DreamWorks for the Miami project.One rendering from Triple Five Group’s presentation has DreamWorks on the side of a building.The developer is working with the Florida Department of Transportation with recommendations to improve the interchange between Interstate 75 and the Florida Turnpike, which was in the works even before this project was announced. The developer wants a new ramp on the interchange so people on Interstate 75 can get on the Turnpike in both directions. It’s also proposed a Turnpike exit at Northwest 170th Street. Dade deputy mayor Jack Osterholt has announced that the county is expecting to receive plans for the mall and entertainment complex by the end of November. Staffers from Dade, Broward and the state are already analyzing the potential impact of the project, in preparation for the approval process. Miami-Dade Schools Superintendent Alberto Carvalho also spoke in favor of the deal. The school system held a 50-year lease on part of the state land, and Triple Five agreed to pay an additional $7 million for the school board to cancel the lease. “I think we negotiated a good deal,” he said. “The proposed American Dream Miami site sits within the county’s Urban Development Boundary, meaning Triple Five only needs a change in the land’s zoning to move forward”, stated by Jose “Pepe” Diaz, the county commissioner whose district includes the proposed site, and sounded guardedly supportive of the plan. “From what I’m hearing, it could be a great thing,” Diaz said. “But I have a lot of questions.” He cited concerns about traffic, and said he may request Triple Five contribute funds to expand mass transit to the area. About 80 acres of it belong to the state of Florida. Further complicating negotiations, Miami-Dade’s school system holds a lease on a large chunk of the state parcel in a land-bank arrangement for the possibility of future development there. Triple Five has agreed to pay $7 million to compensate the school system for waiving its lease, and Miami-Dade would then purchase it from the state, county officials said. Triple Five would pay $11 million for the state land, officials said, with Miami-Dade County acting as a pass-through for the transaction. County commissioners and school board members are expected to consider the proposals later this month.The state is declaring the land surplus, and Miami-Dade is using its ability to acquire spare property to secure the site for Triple Five under the county’s economic-development ordinance. Miami-Dade would also act as the conduit for Triple Five’s payment to the school board, officials said. But if Mayor Carlos Gimenez and the Miami-Dade County Commission are going to destroy the quality of life of residents with their push to bring a grotesque megamall and theme park to their doorstep, they ought to at least listen to the people whose lives they’re up-ending. “There’s such gridlock already we can’t get out of our own neighborhoods,” says Patricia Collado, a paralegal, mother of a Tennessee-bound firefighter, and president of the Palm Springs North Civic Association. This is a woman who works hard for the middle-class community she has called home for the last 27 years, an unincorporated enclave where people used to slow down, wait — and smile — while ducks crossed two-lane roads, but that is now a showcase for rattled nerves. In the last few years, PSN has fought off annexation efforts by the cities of Miami Gardens and Miami Lakes. The expansion of Northwest 87th Avenue through the neighborhood’s west end has diverted traffic into the once quiet, residential streets. Blasting from a rock mining operation that moved just a few miles west is rattling their homes, cracking foundations. Yet another shopping center and a charter high school are in the works for the neighborhood — although there are already eight schools within a five-mile radius and plenty of retail. As if all that weren’t enough, here comes the overnight surprise that Gimenez has secretly brokered a deal to bring not just any mall, but the “biggest mall in America,” to land to the west of PSN and east of the rock mining operation at the intersection of Interstate 75 and Florida’s Turnpike. Triple Five is a family-owned company started in Canada by Iranian rug dealer Jacob Ghermezian in the late 1950s. Its first mall opened in West Edmonton, Canada, in the 1980s. Ghermezian and his four oldest sons (the five in the company’s name) pioneered the concept of building malls so massive they could serve as tourist attractions. Opened in 1992, the Mall of America reports about 42 million visitors a year. With its Miami venture, Triple Five faces a market that has turned away large and extravagant ventures in recent years. Genting, the Malaysian casino giant, retracted its plan to build the world’s largest casino in downtown Miami in favor of a more modest proposal that remains stalled amid a debate over Florida’s gambling laws.